If you are Shooting targets that are farther than 25 yards away you should consider adding optics to your firearm. Although we really like the flip-up sights on the Kriss Vector, we also wanted to have a red dot sight for some of our activities to increase the speed of targeting an object. The criteria that we use to evaluate red dot optics for a carbine are: 1) brightness, 2) brightness adjustability, 3) attachment method, 4) stability, 5) all weather capabilities, 6) water resistance and 7) price. Since we already had Sightmark Ultra Shot M-Spec Reflex Sights (SM26005) on two of our other firearms we decided to get a similar Sightmark for the Vector. 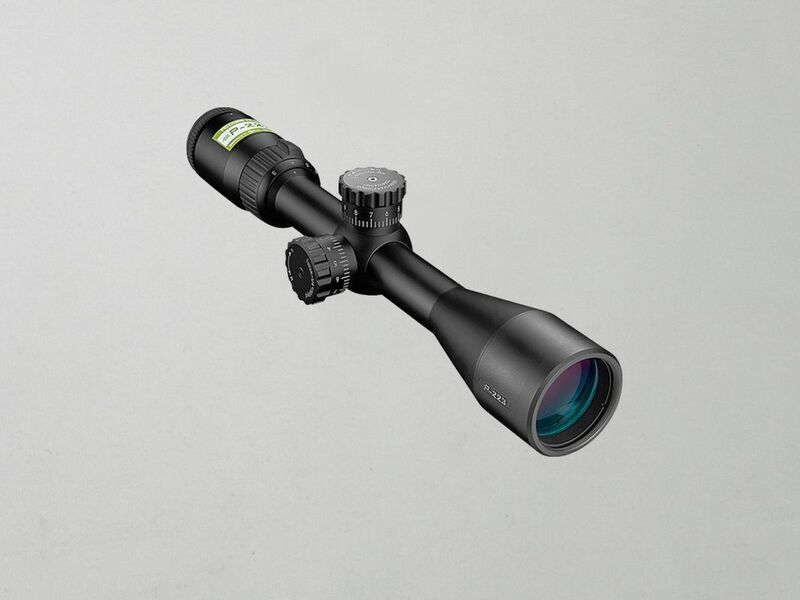 The optics are made of dual-pane glass and have a parallax setting of 25 yards. 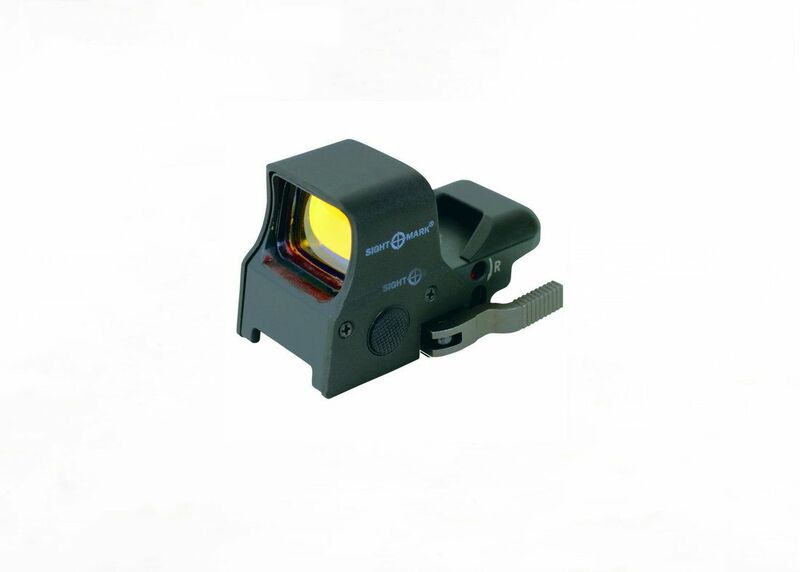 The glass sight window is 1.3” x .95” in size and provides a FOV of 105 feet at 100 yards. 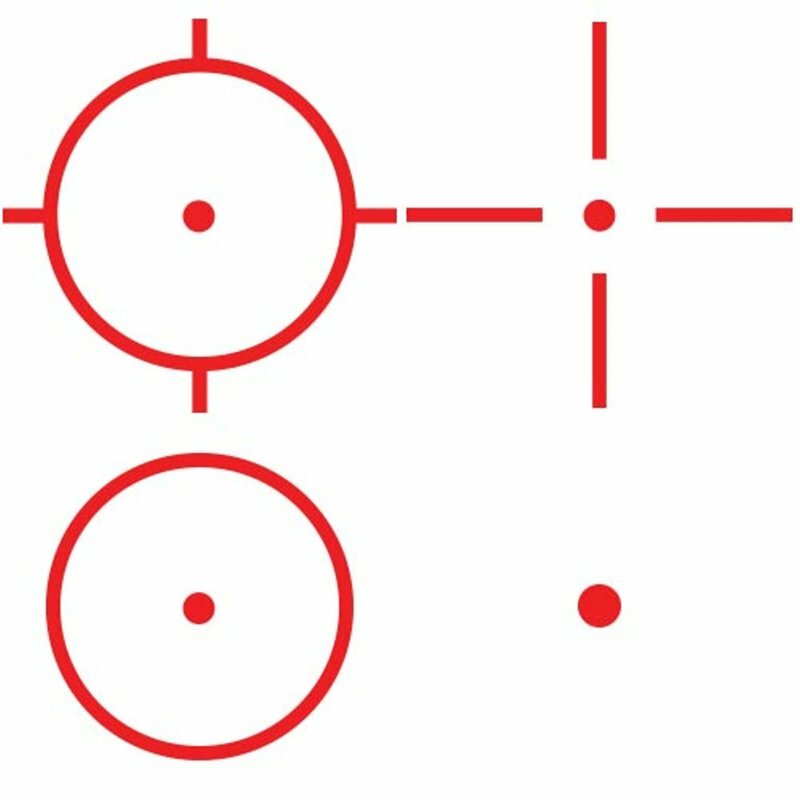 The reticle has 4 different patterns: 1) 3 MOA dot with 30 MOA circle/crosshair (subtensions total 50 MOA), 2) 3 MOA dot with 50 MOA crosshair, 3) 3 MOA dot with 50 MOA circle, and 4) 5 MOA dot.​ The magnification level is 1x (e.g. no magnification). 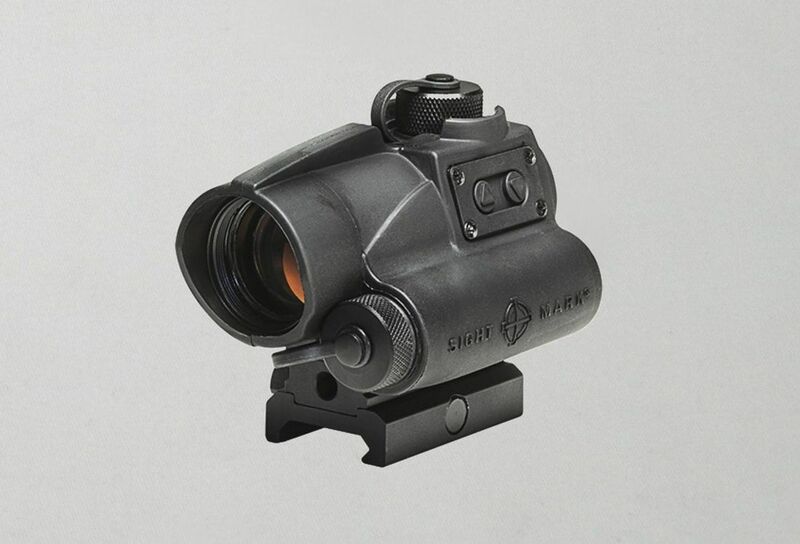 The sight measures 3.7" x 2.2" x 2.2", weighs 7.6 oz, is shockproof, will fit either Weaver or Picatinny rails and has an unlimited eye relief distance. The three (3) AG5 batteries provide operation for 25 to 150 hours depending on which of the five (5) the brightness setting you use. The sight is rated to operate in temperatures between -0 and 120 degrees Fahrenheit. The box comes with the SM14000 optics, neoprene cover, AG5 batteries, cleaning cloth and sight adjustment tool. We like the SM14000 red dot because of the quick-detach mount which allows for quick and easy removal when we want to use the Vector’s flip-up sights, the digital switch button on the side that allows us to adjust the 5 variable brightness settings and the rear switch that allows you to easily select any of the 4 reticle patterns. You can buy this red dot sight at Amazon. Although the CZ Scorpion comes with low-profile aluminum adjustable sights, we also wanted to have a red dot sight for some of our activities to increase the speed of targeting an object. The criteria that we use to evaluate red dot optics for a carbine are: 1) brightness, 2) brightness adjustability, 3) attachment method, 4) stability, 5) all weather capabilities, 6) water resistance and 7) price. Since we already had Sightmark red dot optics on 3 of our other firearms, we decided to look at other Sightmark sights for the Scorpion. Ultimately we settled on the Sightmark Wolverine CSR Red Dot optics since they are good for the ranges that we normally shoot our carbines at (25 to 60 yards) and are very rugged. The CSR is compatible with Picatinny/Weaver rails, has an adjustable mount height, a 4 MOA red dot reticle, a 23mm objective lens and adjustable digital switch brightness controls for 10 levels of brightness. The CSR weighs 10.3 ounces and is spec’d to obtain 50,000 hours of use from a single AA battery at level 6 brightness. The CSR also has night vision modes, which enables the ability to co-witness with a night vision sight. The Wolverine sights are housed in a single piece of 6061-T6 aluminum that is rubber-armored and protected by a scratch resistant, anti-reflective lens coating. Shock proof, fog proof and nitrogen purged, the CSR is designed to operate in temperatures ranging from -22F to 122F. The CSR has an IP67 waterproof rating and is water submersible to three feet. The CSR measures 3.3" x 2.8" x 2.4", weighs 10.3 oz, and has an unlimited eye relief distance. You can buy this red dot sight at Amazon. To allow us to shoot our Winchester Model 121 .22 caliber rifle at 75 feet and beyond we decided to add a scope. The only issue that we had was that since the gun was a relatively old and inexpensive rifle it did not make sense to spend too much on the optics since they would cost more than the gun. The criteria that we use to evaluate scopes for a small caliber single shot rifle are: 1) price, 2) objective lens size, 3) maximum magnification, and 4) variability of magnification. Because of the price and the specifications we purchased the Cabela's .22 LR 3-9x40 Rimfire Scope. 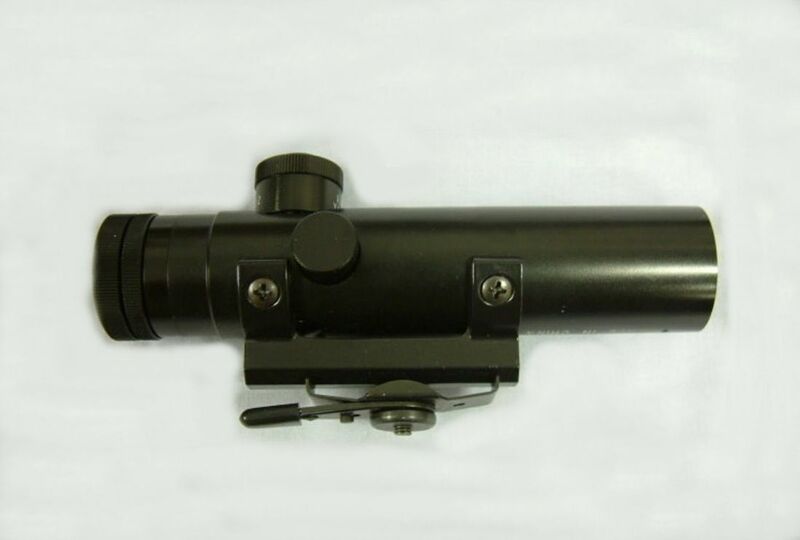 The scope is 12" long, has a 1" tube, has a 40mm diameter objective lens and weighs 14.6 oz. The field of view (FOV) at 100 yards is between 32.3' and 11.3' depending on magnification. The eye relief is between 4.1" and 3.8". The level of magnification is adjustable from 3x to 9x. You can buy this scope at Cabela's. To go with the Cabela's .22 LR 3-9x40 Rimfire Scope we needed to a set of scope mounts. However, this rifle does not have a Weaver or Picatinny rail setup, it has dovetail grooves cut into the top of the barrel. This made finding the right scope mounts a little more challenging. 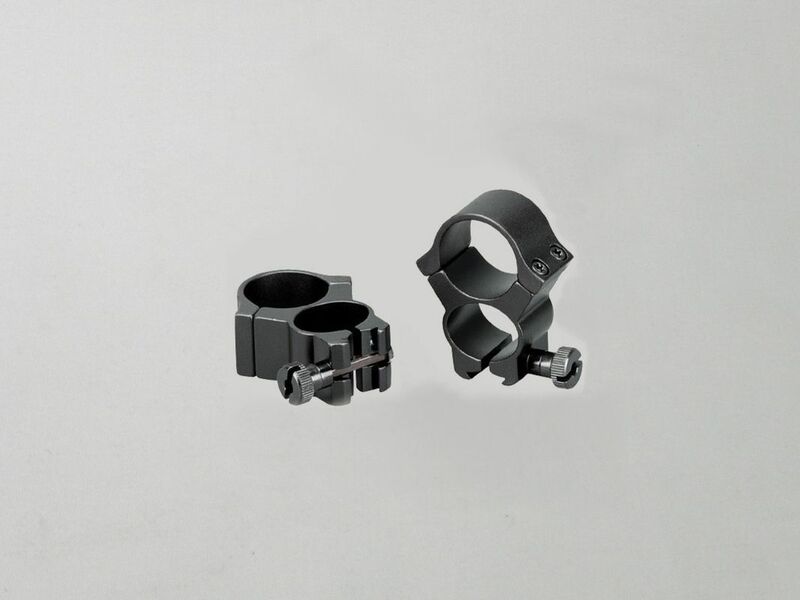 The criteria that we use to evaluate scope mounts for a small caliber single shot rifle are: 1) scope tube diameter fit, 2) dovetail groove fit, 3) rise above the bolt handle, 4) rise above the iron sights, 5) stability and 6) price. After a couple of attempts we found a pair of Redfield .22-Caliber 1" Quick-Peep Rings for 3/8" Dovetail Mounts that did the trick. The rings were far less expensive than many mounts, clamped down on the dovetail grooves and lifted the scope up enough to avoid the bolt and iron sights. You can buy these scope mounts at Amazon. For our small caliber multi-shot rifle we decided to use a red dot reflex sight since we shoot it in a more tactical manner at ranges from 15 yards to 60 yards. The criteria that we use to evaluate red dot optics for a small caliber multi-shot rifle are: 1) brightness, 2) brightness adjustability, 3) attachment method, 4) stability, 5) all weather capabilities, 6) water resistance and 7) price. Let’s face it you can spend a lot on optics for your firearms. The real trick is to balance what you need and the price you want to pay. The biggest part of that equation is distance. If you are shooting at 300+ yards – then you need extremely high quality optics and magnification. If you are shooting tactical targets close in then you really don’t need magnification – just good targeting. For our .22 caliber S&W 15-22 we decided that what we needed was a sight that would assist in close in targeting. Because of this we purchased the Sightmark Ultra Shot M-Spec Reflex Sight. For less than half the cost of an EOTech sight we got a red dot sight made of magnesium alloy that has six variable brightness levels for daytime use (1-6) and six settings in night vision mode (NV1-NV6). The optics are made with of dual-pane glass and have a parallax-corrected lens system allowing targeting from 10 yards and beyond. 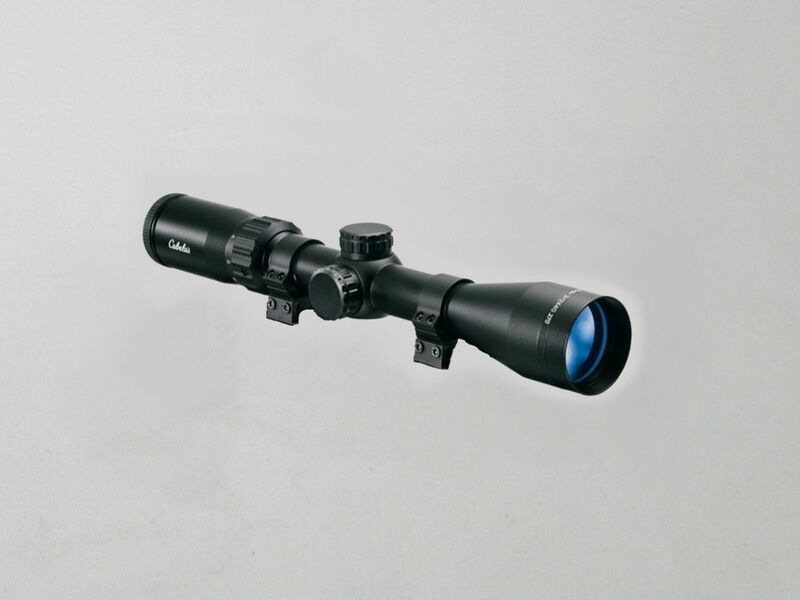 The glass sight window is 1.3” x .95” in size and provides a FOV of 115 feet at 110 yards. The reticle has a 65 MOA Circle Dot Crosshair (60 MOA circle with 5 MOA subtension, 2 MOA central dot). The magnification level is 1x (e.g. no magnification). The sight measures 4.1" x 2.3" x 2.4", weighs 8 oz, is shockproof, fog proof, submergible up to 40 ft., will fit either Weaver or Picatinny rails and has an unlimited eye relief distance. The 3 volt CR2 battery provides operation for 90-1000 hours depending on the brightness setting used. The sight is rated to operate in temperatures between -20 and 140 degrees Fahrenheit. The box comes with the SM26005 optics, neoprene cover, CR2 battery and sight adjustment tools. You can buy this red dot sight at Amazon. Since we use our Stag Model 9 pistol caliber multi-shot rifle in much the same way as we use our S&W 15-22 we decided to put the same Sightmark Ultra Shot M-Spec Reflex Sight on it. The criteria that we use to evaluate red dot optics for a small caliber multi-shot rifle are: 1) brightness, 2) brightness adjustability, 3) attachment method, 4) stability, 5) all weather capabilities, 6) water resistance and 7) price. Let’s face it you can spend a lot on optics for your firearms. The real trick is to balance what you need and the price you want to pay. The biggest part of that equation is distance. If you are shooting at 300+ yards – then you need extremely high quality optics and magnification. If you are shooting tactical targets close in then you really don’t need magnification – just good targeting. For our .22 caliber S&W 15-22 we decided that what we needed was a sight that would assist in close in targeting. Because of this we purchased the Sightmark Ultra Shot M-Spec Reflex Sight. For less than half the cost of an EOTech sight we got a red dot sight made of magnesium alloy that has six variable brightness levels for daytime use (1-6) and six settings in night vision mode (NV1-NV6). The optics are made with of dual-pane glass and have a parallax-corrected lens system allowing targeting from 10 yards and beyond. 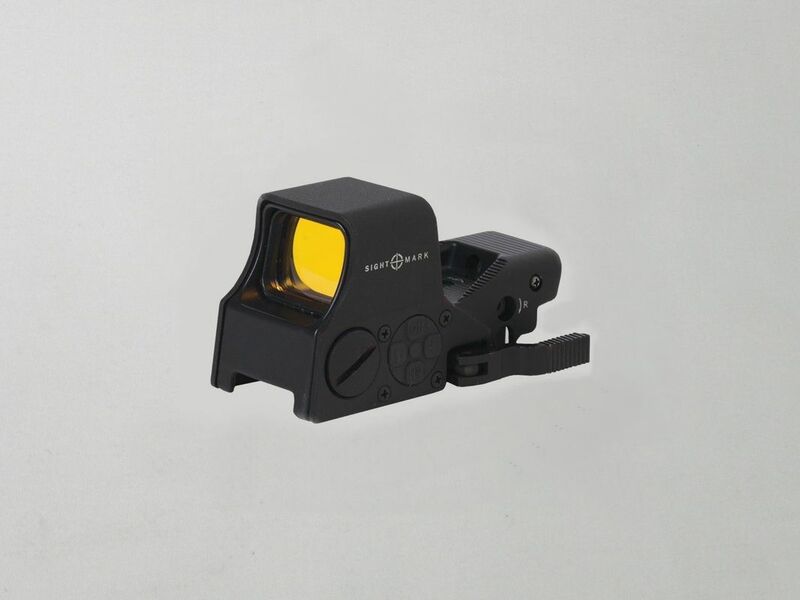 The glass sight window is 1.3” x .95” in size and provides a FOV of 115 feet at 110 yards. The reticle has a 65 MOA Circle Dot Crosshair (60 MOA circle with 5 MOA subtension, 2 MOA central dot). The magnification level is 1x (e.g. no magnification). The sight measures 4.1" x 2.3" x 2.4", weighs 8 oz, is shockproof, fog proof, submergible up to 40 ft., will fit either Weaver or Picatinny rails and has an unlimited eye relief distance. The 3 volt CR2 battery provides operation for 90-1000 hours depending on the brightness setting used. The sight is rated to operate in temperatures between -20 and 140 degrees Fahrenheit. The box comes with the SM26005 optics, neoprene cover, CR2 battery and sight adjustment tools. You can buy this red dot sight at Amazon. Since our Stag Model 3 5.56/.223 AR-15 is a more serious rifle that we use to shoot at targets further away we decided that we needed a scope with magnification rather than a tactical red dot sight. The criteria that we use to evaluate scopes for a large caliber multi-shot rifle are: 1) objective lens size, 2) maximum magnification, 3) variability of magnification, 4) stability, 5) ruggedness, 6) all weather capabilities, 7) water resistance, and 8) price. Because it is a Nikon scope specifically designed for 5.56/.223 ARs we purchased the Nikon P-223 3-9x40 Mate BDC 600. The scope is 12.4" long, has a 1" tube, has a 40mm diameter objective lens and weighs 17.1 oz. The field of view (FOV) at 100 yards is between 33.8' and 11.3' depending on magnification. The eye relief is 3.6". The level of magnification is adjustable from 3x to 9x. The sight adjustments are made with 1/4-MOA hand-turn tactical-style, zero-reset turrets that have positive click reticle adjustments. The nitrogen filled and O-ring sealed optics are both waterproof and fog proof. This scope was just what we were looking for. It has enough magnification for the distances that we shoot at, enough ruggedness for the environments we shoot in and a reasonable price. You can buy this scope at Amazon. To go with the Nikon P-223 scope we looked for a set of mounts that would provide the stability we needed on an AR platform. Luckily Nikon had specifically made a set of P-223 scope mounts to go with the P-223 scope. The criteria that we use to evaluate scope mounts for a large caliber multi-shot rifle are: 1) scope tube diameter fit, 2) Picatinny rail fit, 3) stability 4) impact resistance and 5) price. Since Nikon had made mounts specifically for the P-223 scope and an AR-15 rifle we purchased them. 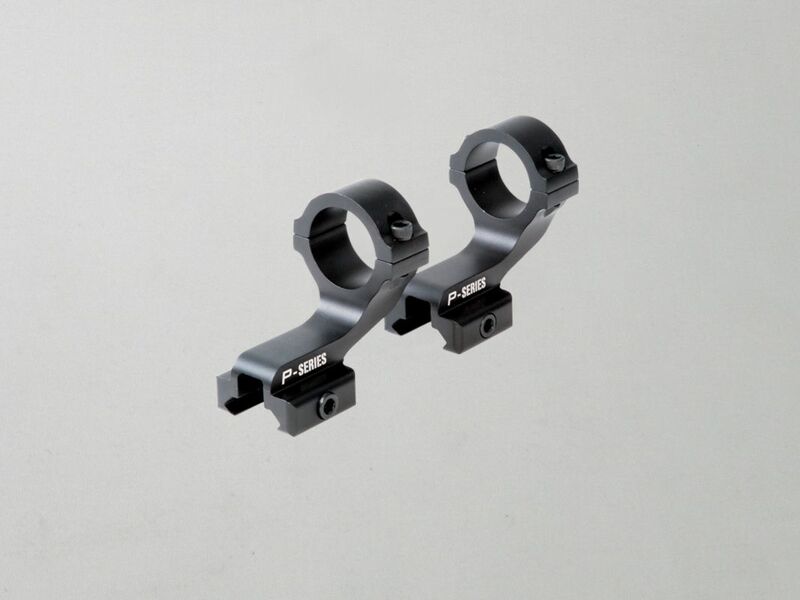 These mounts fit the P-223 scope perfectly and provide great stability. One of the other things that we like about them is that because it is a two piece mount we could easily place the mounts where we needed them on the Picatinny rail to suit our needs. You can buy these scope mounts at Amazon. To go with the Colt R6550 A2 Sporter II AR-15 I needed a scope that would mount on the carry handle. To fill this need I purchased a Red Star 3x20 Rifle Scope with a carry handle mount. The scope is a copy of the original 1960’s Colt 3x20mm scope, has a light alloy tube with a 20mm objective lens, is 6 1/4" in length and has a duplex reticle. Although not the highest magnification optics, it does a really nice job out to 100 yards. Since you will probably not be able to buy this scope at your local FFL dealer, you will probably need to go to gunbroker.com or eBay to find a previously owned one that someone else is selling.